For the past 2 years I have been fortunate to be a member of the judging team for Product Of The Year. I love taking part as I get to share with brands what I like and don't like about their products, not only as a consumer but also as a mother. 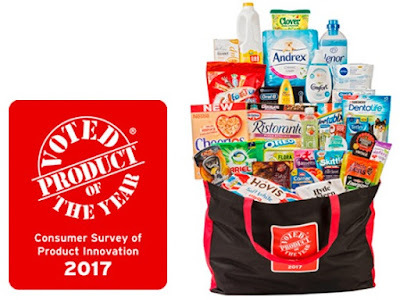 When I go shopping and see the Product of the Year logo I know I'm picking up a high quality product which has been reviewed by other consumers. 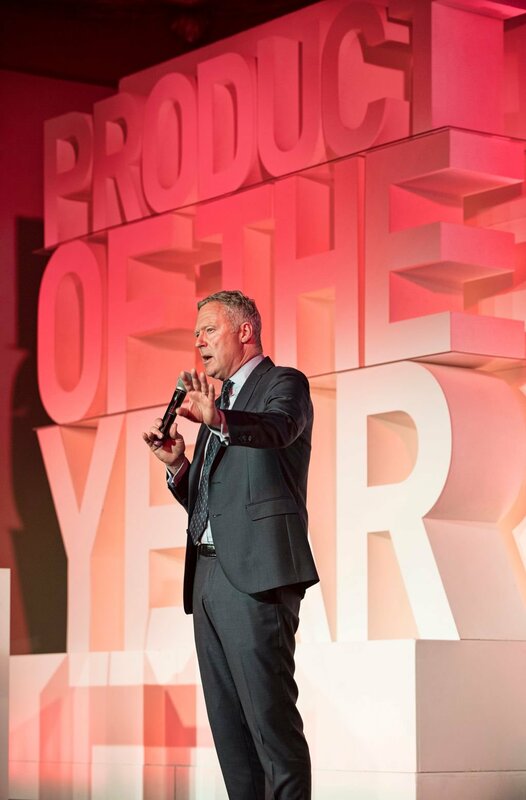 I unfortunately, was unable to attend the Awards ceremony this year which were held at the Sheraton Grand London Park Hotel and was hosted by the fabulous Rory Bremner. Looking at the pictures it looks like everyone had an amazing time. Nivea 3 in 1 Cleasing Micellar wipes, not only effectively remove makeup but also thoroughly cleanses and leaves your skin moisturised and soft. As I suffer with hay fever, Benadryl naturease nasal spray was always going to be a winner especially as it is 100% natural. Boots Soltan Protect & repel suncare lotion is not only good value for money. It is non sticky and smells lovely. Oral B 3D White Luxe toothpaste and whitening accelerator have really helped me naturally whiten my teeth without having to pay to see a professional. As a mum I am always washing clothes. Ariel 3 in 1 Pods wash the clothes really well and Comfort pure conditoner leaves them lovely and soft. 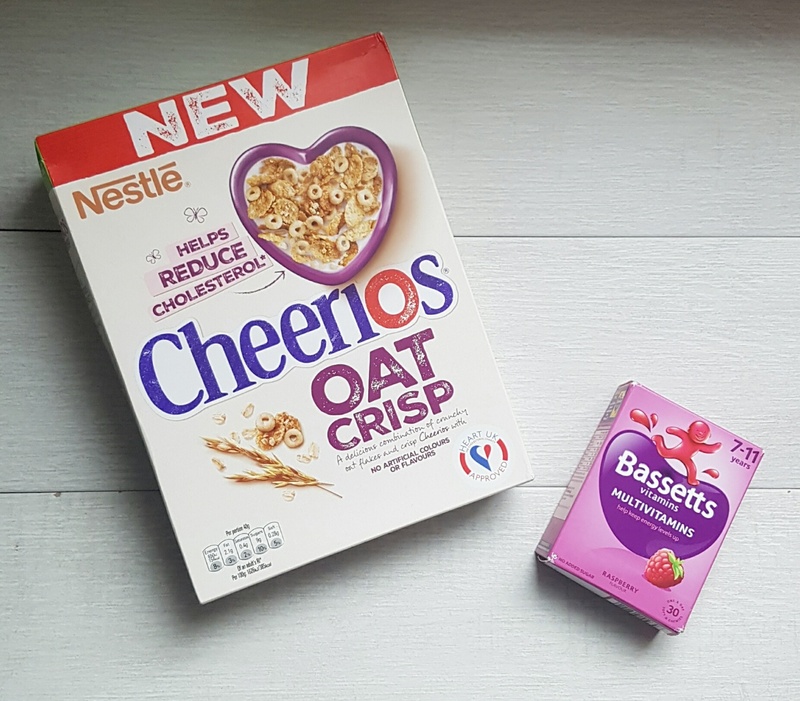 Cheerios Oat Crisp are loved by all of us in the family, not too sweet, crunchy, healthy and filling, whats not to like?. I'm always making sure that we take multivitamins. Bassetts multivitamins are perfect for children aged 7 - 11. Once again I have teamed up with Product of the Year to give one of you lucky readers a goodie bag worth £180. To enter, simply complete one or more of the entries on the Rafflecopter below. Good Luck! So tell me what is your favoruite product and why? Oral B products, trusted brand for us. I always Nivea for my face-wash after shaving, I find it the best for my skin. Neutrogena hand cream leaves my hands lovely and soft. I love the Nivea 3 in 1 Cleasing Micellar wipes. Can't go wrong with them! I've always been a fan of Comfort softener, it makes my washing smell lovely. I love Lenor - It always smells beautiful when you get it out of the cupboard. Bronchostop, it was a winning product last year and we've never encountered another cough medicine that would work as well as this one, for any kind of cough too. Soltan Protect and Repel - such a brilliant, why didn't they think of it before, idea to combine sunscreen and insect repellent - and it's waterproof too. I like Benadryl naturease nasal spray best because it really helps with hayfever. The Nivea wipes. Nivea products have consisted quality and are reasonably priced. The Lenor fabric conditioner. I've switched to it recently because my towels (and everything else!) keep the lovely smell for so much longer than anything else I've tried. Comfort Pure lovely smell and leaves a gentle softness to fabrics. Comfort fabric conditioner. Smells lovely and so gentle. The chocolate dessert pizza is my favourite. I think it's a genius idea! The Benadryl nasal spray, I suffer really badly from hay fever. My nose runs and my eyes itch, it's awful. This really helps with my runny, sneezy nose! Ariel pods, leave clothes smelling and feeling fantastic. My fav product amongst the many is Boots Soltan Protect & repel suncare lotion. Perfect for holidays, I want something that isn't sticky,smells nice and provides good protection from the sun! Nivea 3 in 1 Cleasing Micellar wipes - make my skin feel lovely so quickly and easily. Comfort have used it since my little girl was a newborn! the nivea wipes! i love them! i have some in my bag too! Comfort Pure for me a family fave, my children love Oreos for there treat. Amazing bundle of faves thankyou for the chance. The Lenor, it smell great and does its job right. I like the BLiss yogurts- really smooth and creamy and all the family loves them. I like Cetraben. It's great for mild dry skin. Neutrogena hand cream, it always leaves my hands feeling soft. Almond breeze nut milk - such a great tasting alternative to dairy. Nivea wipes, definitely amazing everyday makeup remover! Always buy these without fail. Andrex, as I was brought up with it. I swear by comfort fabric conditioner! Makes clothes smell amazing! My favourite product is the Dr Oetker pizza because it's so yummy! The Ariel Pods. Their quality is amazing. They leave my clothes fresh, clean and soft. Comfort fabric softener. Smells lovely and doesnt make me itch! the Nivea 3 in 1 Cleasing Micellar wipes are the first thing last thing I use at night. Arial pods as I'm always needing them! Muller Bliss yoghurts because they taste divine! Nivea 3 in 1 Cleasing Micellar wipes as Nivea is really gentle on my skin.The wipes are really handy. Boots Soltan Protect & repel sun care lotion - always use this on holiday the combination of sun lotion and insect repellent is great. Cheerios - one of my fav breakies. Andrex - because I don't give a sh..I'm sure you get the idea. Cheerios oat crisp - So tasty and healthy too - bonus! Hovis bread is one of my fave products. I use it virtually every day and it's good to see a traditional British brand still being so successful. I love Dr Oetker Ristorante Pizzas. They taste like restaurant pizzas at a fraction of the cost and are a great family pleasing treat. Soltan - I wear sun tan lotion every day on my face and this one is great. Comfort pure because it's really gentle and I've used it for years since my children were born. Ariel 3 in 1 Pods as I think they are the best laundry cleaning product. Apart from the obvious tasty treats, my favourite is Lenor. Both myself and my eldest son have sensitive skin and suffer from outbreaks of eczema if our skin is subjected to anything too harsh. I have found that using Lenor allows us to wear fresh smelling clothes with no adverse effects to our skin. Love it. Lenor as it leaves such a fresh scent on laundry. Andrex , especially if they bring back the Soft toy giveaway !!! adrex! cant beat decent loo roll! ArieL 3 in 1 pods. 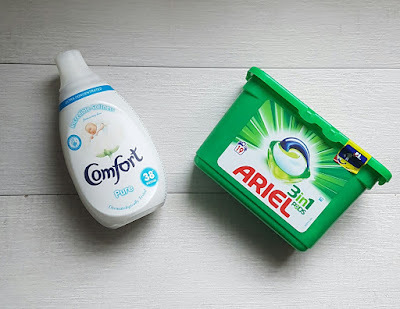 I have sensitive skin and react to a lot of detergents but ArieL works really well for me! Andrex toilet tissue is the best because it is soft and strong and it's much better to pay the extra few pence than think you are getting a bargain with the cheaper brands as the Andrex will always last longer. The Nivea miscellar wipes are great, leaves my face feeling fresh and clean without drying it out. Has to be is Andrex because it's soft & not weak! Love Lenor Fabric Conditioner - the fragrances last so long! Nivea 3 in 1 Cleasing Micellar wipes - I've just discovered these wipes and I love them, they leave my skin so soft! I really like the Ariel 3 in 1 Pods, because I find that they do a great job of washing my clothes. The Cheerios Oat Crisp taste fab and all my family like them. Hovis bread as it's something I use everyday and it tastes delicious. Ariel liquitabs. they are great and smell nice i discovered them by accident some moths back when i sent my son out for washing powder and he came back home with these, i thought i had best try them or no washing would get done and they are great because you just put them in the machine drum but where i was using powder before and im in a hard water area the powder drawer was forever clogging up and would be a bit of a job keep clearing it but unlike powder there is no trace of these at all once the washing is done except the fragrance. great product that now i couldnt live without.so thank u procter and gamble for a great product. I love Ariel to wash the kids clothes in as it gets them really clean and fresh! I love the Nivea Miceller Wipes they are fantastic! Out of the basket I love the Lenor! Smells amazing and so fresh. Mum is Palmer coco butter the range for children, the Bottom Butter is for not only sore bums but any dry areas on my son or me! Especially my hands! Ariel 3in1 pods... Gets my clothes really clean, even gets the stains out the kids clothes and they're perfectly portioned so you actually get tge amount of washes it says on the box. Nivea 3 in 1 cleansing wipes as there are 3 uf us in the house that use cleansing wipes and nivea is one brand that we all use and like. The Asda wonky veg box! I love the fact that tons of vegetables are not being thrown away just because of they way they look! Comfort fabric conditioner. It makes my clothes smell and feel so good. 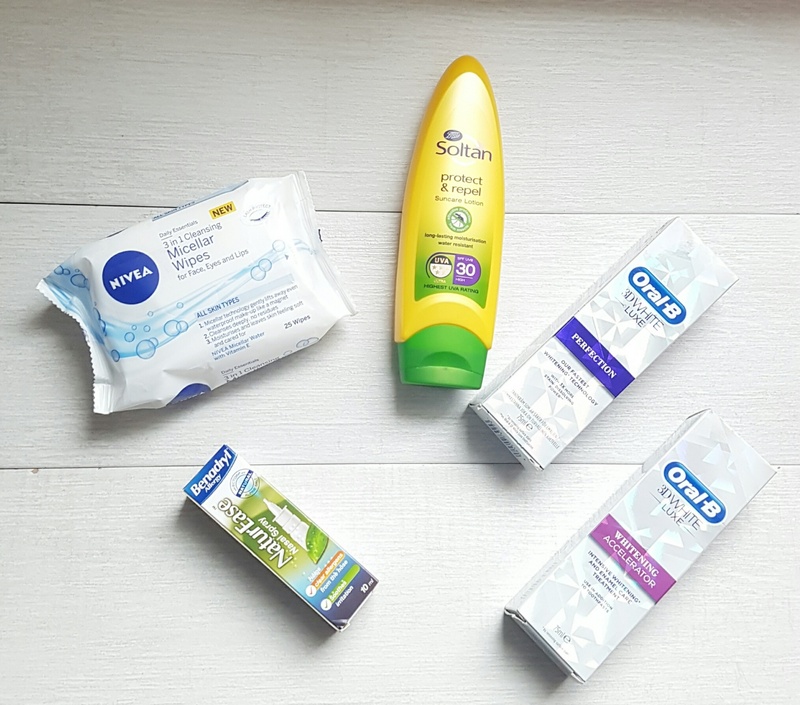 I love the Nivea 3 in 1 Cleasing Micellar wipes, they're great for popping into your bag to freshen up when out or taking on camping trips. Bassett multivitamin for children.My kids love them..
Andrex, been good reliable quality for a long time! Lenor fabric softener - it does the job and I actually like the scent, Spring awakening, as it is not too overpowering, but very fresh. Blistex intensive lip moisturiser. I suffer with cracked lips all year round so this is a life saver for me. Weetabix Protein - my favourite breakfast staple made even better. I would love to try the Benadryl naturease nasal spray. I suffer with hayfever in the summer especially when trying to enjoy pottering in the garden! I usually use tablets but maybe time to try something new. Oral B 3D White Luxe toothpaste, i've been using it for months now and it does help whiten my teeth-no doubt about it!